Spaghetti alla puttanesca translates literally as “spaghetti of the whore” in Italian. I’m sure there are many stories as to how this dish got it’s ‘flavorful’ name and who gets the full credit for it’s creation, but I’m not going to go there. 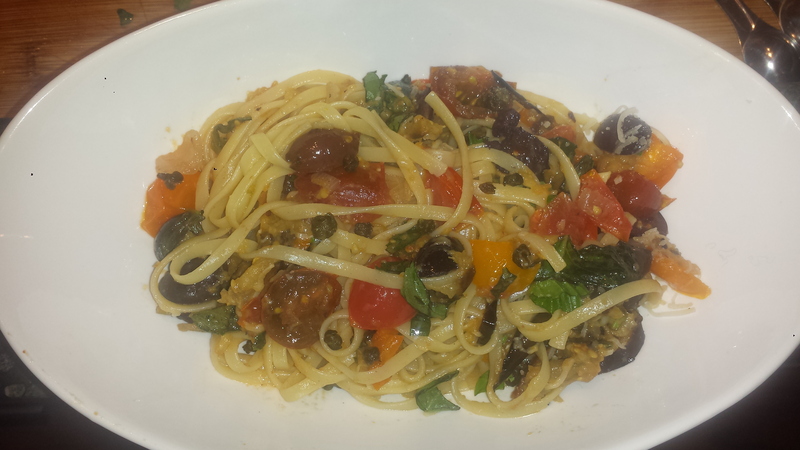 I’m only going to suggest that maybe this combination of tangy olives, salty capers, sweet tomatoes, fragrant garlic and aromatic fresh basil all whirled around in a good olive oil is so delicious that it is ‘sinful’. Puttanesca is a classic Southern Italian sauce that is very versatile. 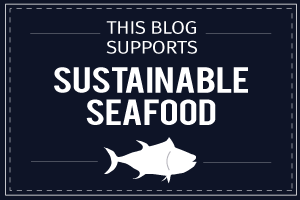 It is great on any kind of pasta, drizzled over creamy polenta, or even on toasted bread or crostini as an appetizer. I opted to add eggplant, as I just happened to have a nice fat one sitting on my counter, and I wanted to make it a little more filling as a main course. Roasting the eggplant first gives it a nice creamy texture that blends nicely with the sauce. I also fried the capers, as I had seen in a Vegetarian Times recipe, which makes them crispy and gives the dish an additional pop of flavor. TIPS: You can make a more traditional Puttanesca sauce and leave out the eggplant, if you are so inclined. I happen to love eggplant but I know not everyone is a fan. 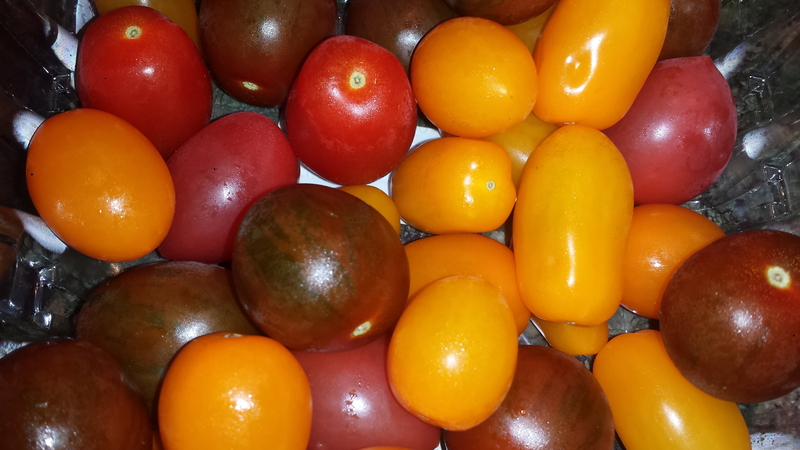 If you can’t find cherry tomatoes or other good fresh tomatoes this time of year, use a can of chopped tomatoes. If you are pressed for time, you can skip salting the eggplant before roasting. 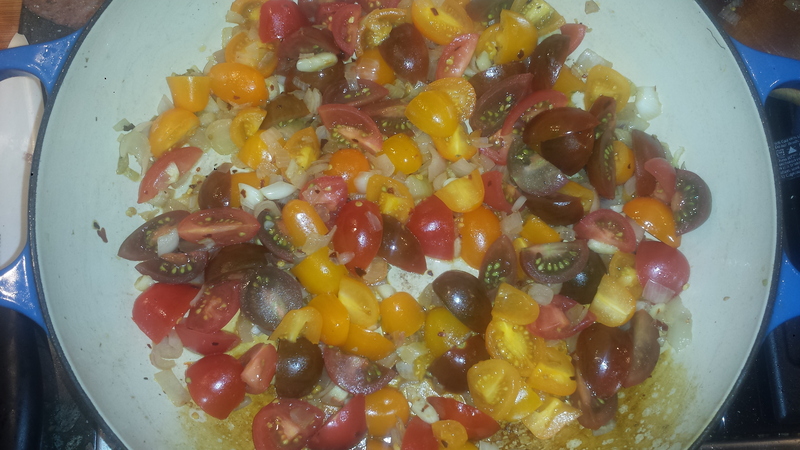 You can also skip the roasting if you are really in a hurry, and add diced eggplant in before the tomatoes. The texture will be different but should still taste pretty good. 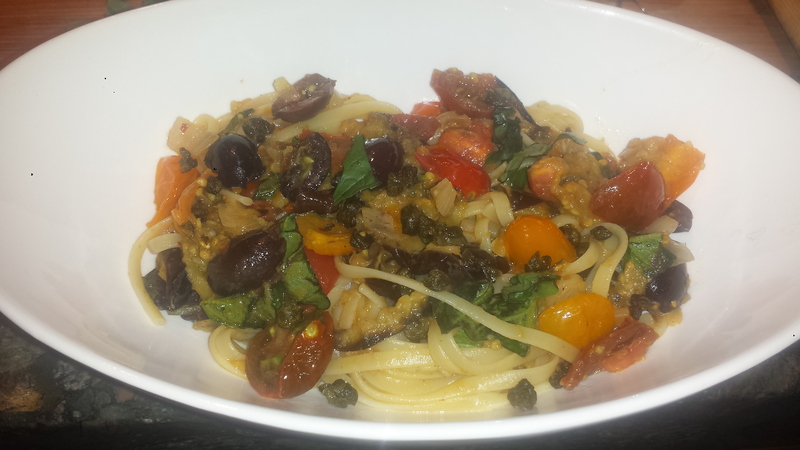 Additionally, the capers do not need to be fried if you prefer them in their original state. 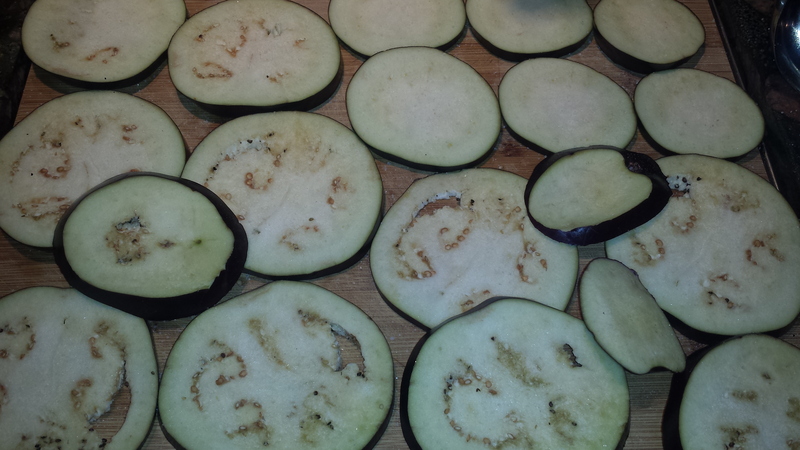 Slice eggplant into 1/4 inch circles and lay in a single layer. Sprinkle with salt and let sit for about 10 minutes or until water beads up on the surface. Brush eggplant slices with 1 Tbsp olive oil. 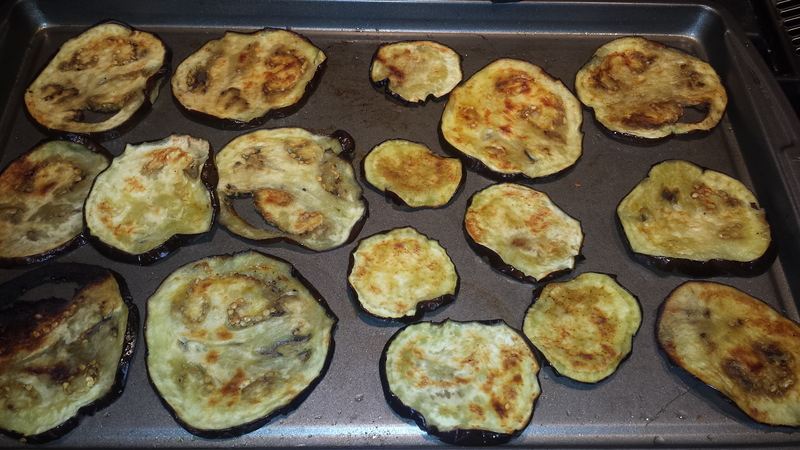 Broil eggplant slices in single layer until browned on top (3-5 minutes). Turn to brown the other side. Remove from oven and let cool. Roughly chop eggplant or slice into strips and set aside. Slice olives in half and cherry tomatoes in halves or quarters. Slice basil into julienne strips. Heat oil in large frying pan over medium-high heat and fry capers, 1 to 2 minutes, or until many capers have split. 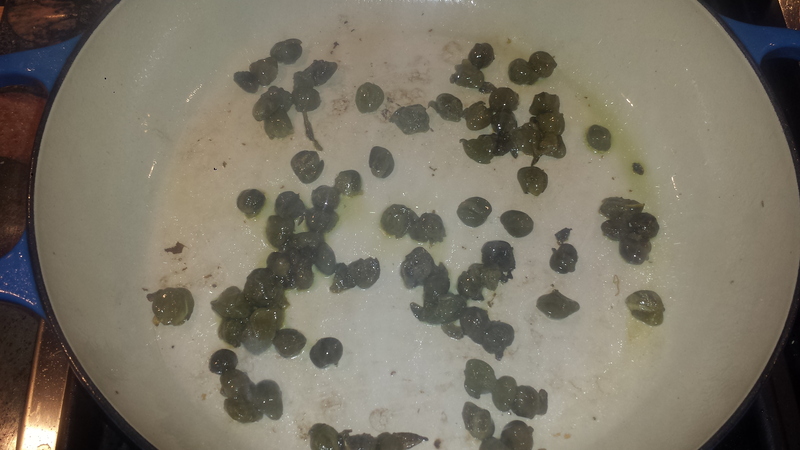 Remove capers with slotted spoon, and drain on paper towels. 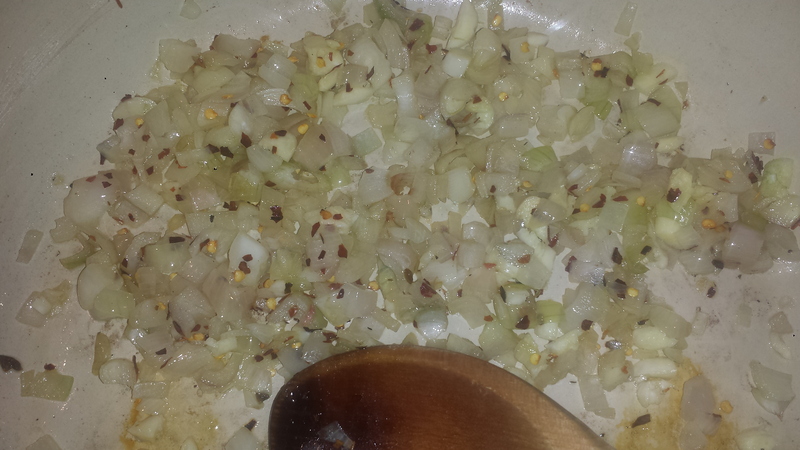 Using the same pan, saute onion 3 to 5 minutes, or until translucent. Add garlic and red pepper flakes, and saute another minute. 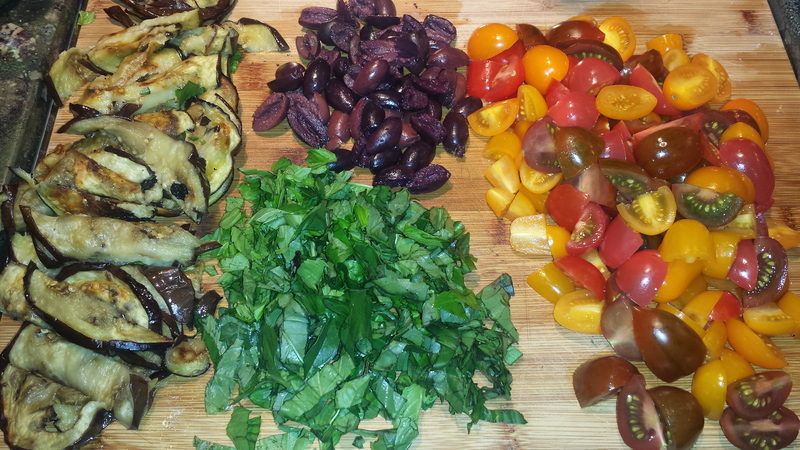 Remove from heat and stir in eggplant, half of basil and olives. Cook pasta according to package directions. Scoop out a half cup of pasta water and reserve before draining pasta. 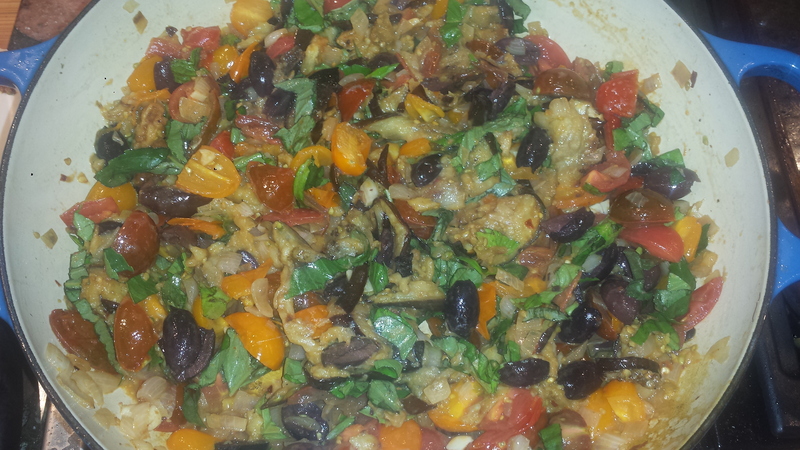 Add drained pasta to pan with eggplant sauce, and toss gently to combine, adding some of the pasta water if needed. 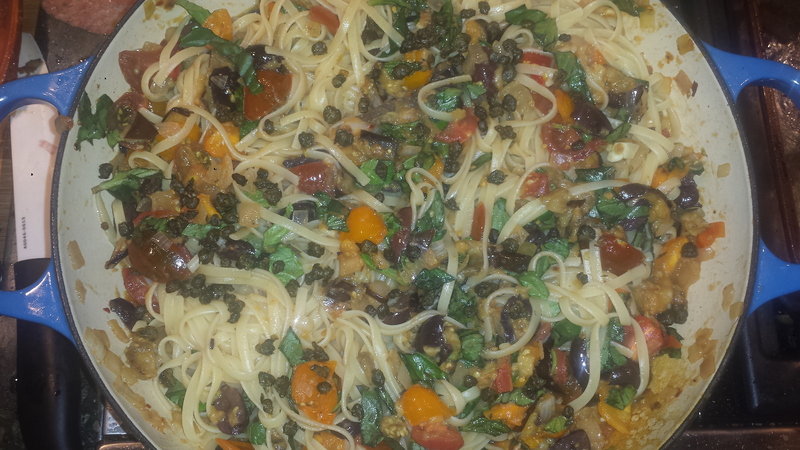 Serve garnished with remaining basil, capers and a sprinkle of parmesan, if desired. Brush eggplant slices with 1 Tbsp olive oil. Broil eggplant slices in single layer until browned on top (3-5 minutes). Turn to brown the other side. Remove from oven and let cool. Roughly chop or slice into strips and set aside.